The new batteries arrived today in a small but heavy package. I pulled the brand new Imedions out of the box, and tested them for voltage. All but one was charged enough to suit me out-of-the-box. There was one cell that had a little lower voltage but, fortunately, I had kept a pre-charged spare in the battery drawer, to round out the eight battery line-up. Next, I pulled four dual “C” battery holders from the same small mail package, and arranged them on a piece of trim board (not something a person should normally do, but I did for this little test). The next little jewel that I pulled from the shipping container was the DC-DC (voltage, not frequency) down-converter. Not being patient enough to wait for the housing that I ordered, and that the batteries will ultimately reside within, I soldered a switch to a couple wires, pushed the batteries into place, connected the pack to the DC-DC converter, and threw the switch! I adjusted the output voltage of the converter to 5.20 volts, and plugged the wired connector into the tablet’s female power jack. The tablet booted, and the input voltage didn’t flinch. At All! 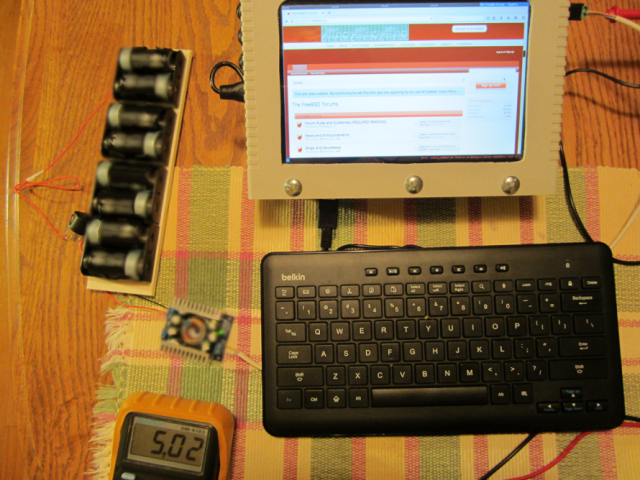 The voltage, as measured at the tablet, was rock solid at 5.02 volts. After an hour and a half, the voltage was still exactly the same at 9.75 volts (on the batteries), and 5.02 on the tablet itself. There’s a .18V drop across the power cord, which is fashioned from a piece of thin telco cable I pulled from the junk drawer. That’ll be upgraded shortly! At the two hour mark, the voltage was still rock solid. The heat sinks on the DC-DC converter, and the batteries themselves, were both cool as a cucumber. It’s obvious already that the extra batteries are worth the somewhat higher cost, and the way to go is up-to-down (rather than vice-versa). The only way the down-to-up booster approach makes sense in in a headless server without an LCD monitor to drive. Doing a calculation, 9.75V / 8 cells = 1.2187 volts per cell, which is right where they oughta be. No significant heat felt on the heat sinks means no energy wasted, and the current from the batteries should be pretty close to the output current to the tablet, modified by the ratio of the output and input voltages. When the first run has completed, I will put the ammeter in series with the battery leads, and get the exact efficiency. So far though – it’s looking great! At the four hour mark, the C1 and the LCD were still running fine. A check on the battery voltage indicated that it was around 8.6 volts, which is getting close to discharged status. However; the batteries had only been charged to 85% before the test. This means that fully charged batteries may run 4.5 or more hours. I spliced the B+ lead, and inserted an ammeter into the eight cell battery circuit. The current was 750 mA and the voltage 10.35 volts. 750 mA x 10.35 V = 7.76 watts. The output of the converter was 1450 mA and the voltage 5.2 volts. 1450 mA x 5.2 volts equals 7.54 watts. So, the efficency with eight cells is 7.54 / 7.76 = 97 percent.